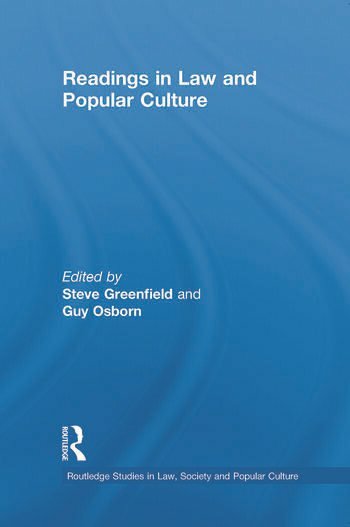 Readings in Law and Popular Culture is the first book to bring together high quality research, with an emphasis on context, from key researchers working at the cutting-edge of both law and cultural disciplines. Fascinating and varied, the volume crosses many boundaries, dealing with areas as diverse as football-based computer games, Buffy the Vampire Slayer, digital sampling in the music industry, the films of Sidney Lumet, football hooliganism, and Enid Blyton. These topics are linked together through the key thread of the role of, or the absence of, law - therefore providing a snapshot of significant work in the burgeoning field of law and popular culture. Including important theoretical and truly innovative, relevant material, this contemporary text will enliven and inform a legal audience, and will also appeal to a much broader readership of people interested in this highly topical area. 1. Introduction. Part 1 – Theory and Academia 2. The Case of Buffy the Vampire Slayer and the Politics of Legal Education 3. Peter’s Choice: Issues of Identity, Lifestyle and Consumption in Changing Representations of Corporate Lawyers and Legal Academics 4. Beyond Textual Analysis: Are the Media Really Shaping People’s Understanding of the Law? Part 2 – Sport 5. Contextualising the Football Disorder Act: Proportionality under the Hammer 6. Sports and the Countryside in the 21st Century 7. Virtually Foul or Virtually Fair? FIFA, Fair Play, Fouling and Football Games 8. The Juridification of Sport Part 3 – Film, Literature and Music 9. The Justice Films of Sidney Lumet 10. Gender, Power and Law in Screwball Comedy: Re-viewing Talk of the Town and Adam’s Rib 11. Five Find Treasure: The Ownership of the Past in Enid Blyton's Five on Finniston Farm 12. A License to Bill? Power Relations and Contemporary Themes in Music Copyright 13. The Legal Implications Surrounding the Practice of Video Sampling in the Digital Age 14. Law, Music and the Creative Process – Who Is an Author? Guy Osborn is Professor of Law at the University of Westminster, UK. His recent research includes work on the deregulation of licensing law, music contracts and contractual theory and blasphemy in entertainment. Steve Greenfield is a Senior Academic at the University of Westminster, UK and has written widely in the field of law and popular culture. Steve and Guy are the founding editors of the journal Entertainment Law and the series Routledge Studies in Law, Society and Popular Culture.